Some information about the design of track used on the London Underground and the traction power supply system. The London Underground has always used the old UK standard bullhead rail weighing 95 lbs/yd and wooden sleepers. Only in the last few years has there been a concerted effort to convert the track to flat bottom rail like the rest of the world. The photo below shows the standard LU bullhead track which can still be seen all over the system. It also shows clearly the 3rd and 4th insulated rails used for the LU traction current system. Click on the image for the full size view and description. All London Underground Lines (including the W & C) operate at 630 volts DC using third (positive) and fourth (negative) current rails. The current rails are positioned so that the contact surface is higher than the running rails. This allows the collector shoes on the trains to pass over the running rails without touching them. The positive rail is 3 inches higher than the running rails, while the negative rail is 1.5 inches higher. The positive insulators are thus twice the height of the negative ones and therefore have about twice the earth leakage resistance, so the voltages are set with a proportional disparity between the positive and negative voltage levels. The positive rail is at a potential of 420 volts above earth and the negative rail at 210 volts below earth. In this view above of Surrey Quays (East London Line) the arrangement of current rails is clearly seen. The negative rail is mounted centrally between the two running rails. The positive rail is mounted outside the running rails. Current rails are of a heavier cross section than running rails in this view. Note how the positive rail is positioned away from the platform side of the track. The standard position for the positive rail is usually on the left hand side in the usual direction of travel. The London Underground uses the four rail system for two main reasons. Firstly, it was originally required by the government to limit the voltage drop along the line to 7 volts. This was intended to reduce problems caused by stray currents causing electrolysis affecting utility pipes and cables. Whilst this did not affect the street tramways, whose vehicles were not heavy current users, the currents drawn by trains could cause difficulties. The solution was either to provide heavy return cables and boosters or to use a fourth rail. The fourth rail was chosen, partly as a cheaper option and partly for signalling reasons. As direct current track circuits were to be used to control signals, an insulated return system for the traction current was an effective way of separating the two systems. Nowadays, this is not so much of a problem as all track circuits are AC. It is interesting to note that it is also possible to maintain a service if one pole of the supply is earthed whereas, if a three-rail supply system becomes earthed, the sub-station circuits breakers will detect the short circuit (usually) and the power will be switched off. On the Underground, if there is an earth, it will be detected by special monitoring equipment and an alarm initiated in the line control room. The cause is then tracked down to, usually, a defect on a train, a current rail problem or the lift/escalator supply, where this is still 630 volts DC. Modern trains on the Underground are provided with on-board earth fault detectors. It is important to ensure that positive and negative earths do not occur in the same traction current section, as this can give rise to high current "loop circuits", which have been known to break down cable insulation and cause fires. See also Sectionalisation Gaps below. Curiously, the Bakerloo was opened (in March 1906) with the polarity of the current rails reversed. There were problems with leakage of the positive rail into the cast iron tunnel segments so the positive side used the centre rail and the negative used the outside rail. This was exacerbated by the fact that the line was supplied through the same system as the District. The problem was solved on the Piccadilly and Hampstead lines by concreting the lower part of the segments near the track. The Bakerloo was converted to normal in 1917, when the line's supply was modernised. Tube tunnels use a different cross section of current rails as seen below. Fig 2: Photo of London Underground track at a typical tube station with a suicide pit. Here, in this deep level tube station, the current rails are of lighter section than the running rails, which have been upgraded to flat bottom rail. The white porcelain insulating "pots", which carry the current rails, can also be seen. In tube tunnels, the rails are mounted on small wooden blocks set into concrete. In the centre of the track, a drainage trough is provided and is filled with ballast to reduce noise. In stations, as shown above, a "suicide pit" is provided between the running rails to assist with the removal of bodies from under trains. In the tunnels, a shallow pit is provided between the rails and is filled with ballast to provide sound deadening and drainage. Renewing track in tunnels is a slow and difficult process due to the need to drill out the blocks and renew the concrete. It usually requires a speed restriction of 10 mi/h while work is in progress. Have you ever wondered what the screeching noise is that you sometimes hear when a train goes round a curve? It's the wheel flanges scraping against the inside edge of the outer rail of the curve. The best way to get rid of the noise and reduce the wear on wheel and rail, is to lubricate the wheel flange. This is done with either track mounted or train mounted lubricators. Fig 3: Track mounted flange greaser located at Rayners Lane. Click on the image for the full size view. 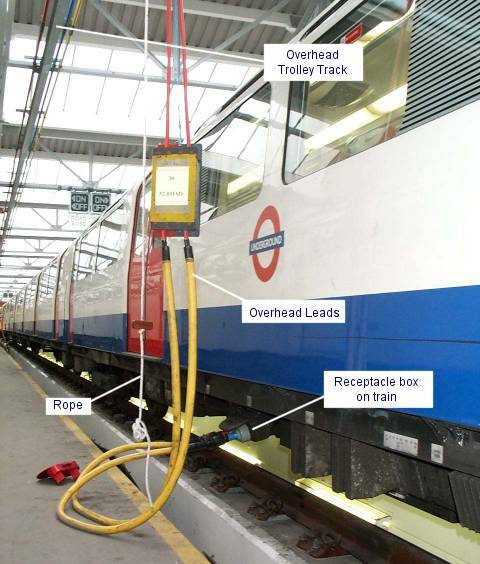 London Underground uses track mounted lubricators and the photo above shows one type commonly seen around the system. The problem with the track mounted type is that is has to be refilled regularly and carefully adjusted to ensure the correct amount of grease or oil is picked up by the wheel.s is not easy to achieve. One Tuesday morning some years ago, following a Public Holiday weekend, almost the whole of the Victoria Line fleet was disabled with flatted wheels caused by emergency braking at stations. The trains had picked up too much grease from a badly adjusted flange lubricator and had skidded at the following station trying to stop in the right place. Train mounted lubricators are usually in the form of a stick of lubricant mounted on the bogie and applied to the wheel under light pressure. They are easier to maintain than track lubricators and are generally favoured on new railway systems. Some recent LU stocks are fitted with these. The trackwork required for the LU fourth rail system can be very complicated. The following example of the scissors crossover at Ealing Broadway shows just what is involved. Fig 4: Crossover at Ealing Broadway showing current rail gaps and ramps . The current rails have to be broken wherever there is any sort of obstruction which could come into contact with the shoes of the train. This can be best seen above where then ends of the current rails are painted white to assist staff walking the track. Where there is a risk of the shoes touching the running rails or any obstruction, a wooden ramp is provided to assist in lifting a low or loose shoe clear. This is shown in the photo below (Moorgate, Metropolitan) where a trainstop requires a break in the positive current rail. The trainstop is protected by wooden ramps. You can see that the ends of the current rails are also ramped to allow a smooth passage for the shoes as they run on and off. Fig 5: Current rail gaps provided at Moorgate for terminal protection trainstops . Traction current is supplied to lines in sections. Sections can be anything from less than one kilometre to several kilometres long. Sections are separated by gaps in the current rails where the sub-stations are located. Each sub-station normally feeds the two sections on either side of a gap. The general arrangement of traction current supply on London underground is shown in the diagram below. Fig 6: General arrangement of traction current supply on London Underground . A section which is fed by a sub-station at each end is known as double-end fed. A section, usually towards a terminus, with a feed at one end only is known as single-end fed. At various places along the line, section switches (Fig 6) are provided to allow small sections of line to be isolated from the supply. At a terminus, section isolating switches are provided to isolate the platform sections from the supply, useful when necessary to deal with a power circuit electrical fault on a train. Section switches are usually manually operated on LU. Many more modern systems allow remote control of section switches. 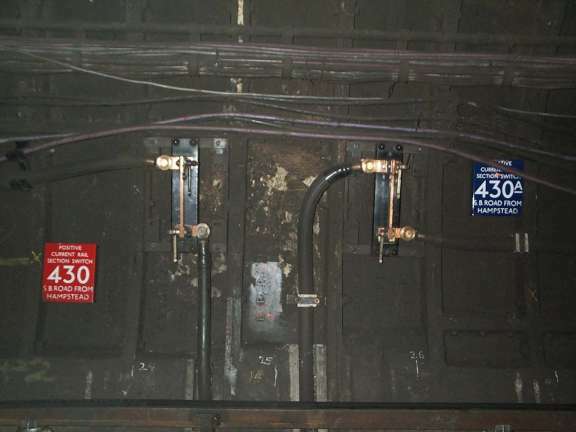 Fig 7: A pair of unguarded section switches mounted on the tunnel wall near Camden Town, Northern Line. Photo by Donald McGarr. Although traction current is intended primarily for trains, there are some escalators still fed from the traction supply and a few heavy-duty ventilation fans and lifts. LU has to restrict the levels of current regenerated by trains (where available) because, if it is too high, the additional voltage will make the escalators run faster than they are supposed to and may cause trains to reach too high a speed. Sectionalisation gaps are similar to normal substation gaps in that they separate the current rail feeds into a pair of adjacent sections but the length of the gap is longer than the traditional gap. This is so that the shoes of a car cannot form a "bridge" between one section and the next. It avoids the risk of a train causing a section with current off being temporarily made live from the adjacent section through the shoes and on-board cables of a car creating a link. Sectionalisation gaps are also arranged so that the substation connections are entirely isolated from each other so that earth faults on one section are not transmitted to the adjacent section. Earth faults are caused when one pole of the system becomes connected to earth, often because of an insulation fault on a train or escalator, or because a current rail is linked to the ground with a metal object. If a positive earth fault occurs in the same area as a negative earth fault some distance away, very high currents can be generated. Originally, most of the London Underground current supply system was linked through substations. After a couple of serious incidents in the late 1950s, where high fault currents generated fires on board trains, the idea of sectionalisation was introduced and the system was de-coupled at a number of strategic locations. On lines built since that time (Victoria and Jubilee extensions) sectionalisation has been provided at all substations. Each sub-station gap is provided with an indicator showing three red lights if the current is off on the section ahead. 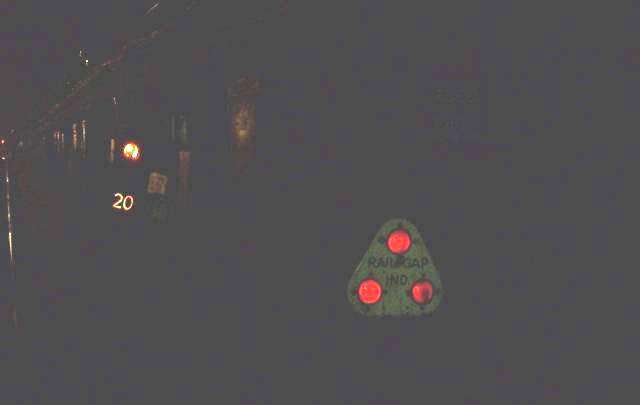 Sites with poor visibility are provided with rail gap repeaters with three yellow lights. Fig 8: This photo (by Donald McGarr) shows a rail gap indicator (RGI) in the tunnel at Camden Town. Just beyond is a 20 mi/h permanent speed restriction sign. If the RGI is illuminated to show three red lights, as shown below, it represents a stop signal. The driver of an approaching train must stop or, if unable to, he must coast over the gap until the whole train is clear. This is to prevent current being transferred from the live section to the dead section by the shoes on the train. Rail Gap Indicators are not provided with trainstops. One of the most embarrassing incident to happen to a driver is to get his train "gapped". This happens when the train stops without any of its current collection shoes connected to the current rails. 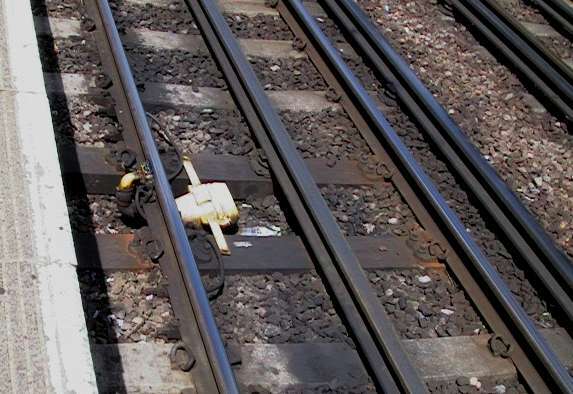 The only two ways out of the problem is either to push the train onto the nearest current rails or to make use of long cables (called gap leads) which can be used to connect a socket on the train to shoes at the other ends of the leads which are then placed on the rails. Both procedures will cause a long delay and leave the driver with a lot of explaining to do. The worst locations for gapping are at the entrances to depots. There are always lots of breaks in the current rails because of all the point and crossing work. One of the most dangerous is at the south entrance to Neasden Depot. If you had a short train, it was best never to stop and to hope that the shunter was available to give you the road number and stop point as you ran in. If he wasn't there, you just ran in and stopped where you knew it was safe. You could not risk stopping and gapping your train across both Jubilee tracks and the southbound Metropolitan Line. London Underground tunnels are fitted with Tunnel Telephone Wires. These are uncovered wires used to switch off traction current in emergency. A current of 5-10 volts runs through the wires and energises a relay at the local substation(s). If this current is lost, the relay is de-energised and the circuit breaker opens at each end of that current section. This cuts off the 630v traction current feed. Even through the relay may then become re-energised, the circuit breakers will remain open until reset. The relay can be de-energised through various means such as the train operator pinching and rubbing the two telephone wires together or the the operator connecting a portable handset to the wires. This will then also allow him to speak to the Line Controller. Other connections on the wires in that section include tunnel telephones and section plungers provided at stations. The Line Controller has a remote facility (a bank of switches on his desk for each traction current section on the line) which allows him to effectively short circuit the tunnel telephone wires in the same way as the T/Op shorting them. Defective tunnel telephone wires/equipment will also result in the relay becoming de-energised. If the equipment cannot be reset due to a fault on the tunnel telephone circuit, the circuit can be overridden. A "T" board will then be displayed to drivers at the relevant stations to tell the train operators that the tunnel telephone wires are not working. With the advent of train radio, the tunnel telephone wires are rarely used to switch off traction current these days. However, they do offer an alternative means of contact to the Line Controller in an emergency if there is a problem with the train radio. Traction current will be switched off when the handset is used but the Line Controller can soon arrange for it to be switched back on again and using the tunnel telephone wires in this way will usually mean less of a delay than trying to contact somebody by other available means. Sometimes, too many trains in a section will cause current to go off. The more current drawn in a section, the more the traction current voltage drops. As a consequence, some equipment on a train may also cut, out MGs/MAs for example. Some black spot where this happens are between South Wimbledon and Morden (Northern), Russell Square and Holloway Road and Wood Green to Southgate, (Piccadilly Line) and Baker Street to Finchley Road (Met.). A favourite for South Wimbledon to Morden in 1938 Stock days was when trains were queuing up to get into Morden and it was nothing unusual to put the handle into motoring and find the tunnel lights come on, put it back to off and the lights go out. Traction current wasn't lost, but the drop in traction current voltage was sufficient that the tunnel lighting relays couldn't remain energised and thus the lights came on. From information posted by Roger Mather, uk.transport.london, May 2000. Listed below are the locations of the traction current sections for some lines on the Underground. Substation gaps (dividing the two sections) are located where the feed from the substation goes to the current rails. Generally, the traction current section (or subsection as it is often known) is named according to where it is fed from and the direction of travel, e.g. Stockwell to Elephant & Castle NB. Although not a substation location, Kennington CX branch is divided up between Lambeth South and Lambeth North thus, Lambeth South-Kennington SB, Kennington Loop, Kennington-Lambeth North NB. Substations shown in capital letters have Sectionalisation gaps. 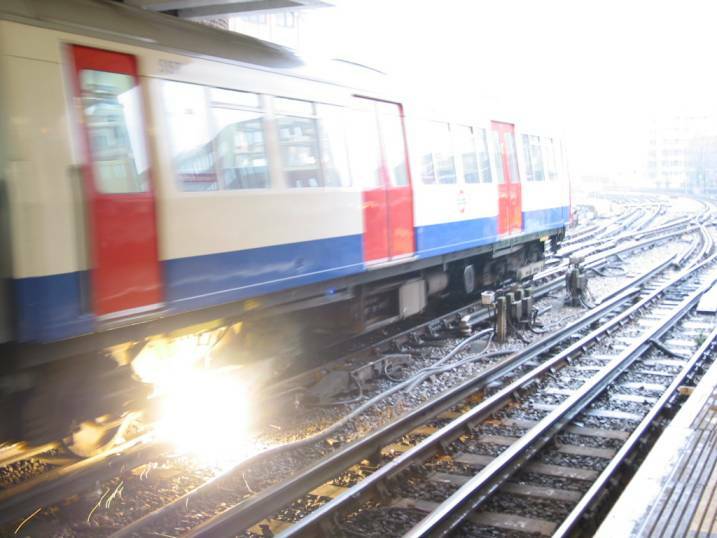 Sectionalisation gaps were introduced in a response to two serious incidents which occurred in 1958 and 1960, when earthing problems caused trains fires on the Central Line at Redbridge and Notting Hill Gate. The cause was due to a positive earth on one part of the supply system and a negative earth on another. The resulting high current loop was sufficient to break down the insulation on vulnerable parts of the trains in question. To reduce the risk on a re-occurrence, the power supply system was "sectionalised" into groups of sub-stations and long gaps provided to separate them. The long gaps prevents the shoes on a train from bridging the gap and transferring a fault from one part of the system to another. Some information supplied by Donald McGarr, 3518+3227 and romic in uk.transport.london July 2000. The current is collected by shoes attached to the trains as shown below on a 1973 Tube Stock motor car at Acton Town. Fig 9: Equipment provided on shoebeam of 1973 Tube Stock car. The positive shoe is sitting on top of the current rail. There is a similar negative shoe out of sight under the bogie. The support for the positive shoe is a laminated wooden beam hung from the axleboxes, known as a shoebeam. There is also a shoebeam for the negative shoe but this is much smaller and is mounted between the motor case and the bogie headstock. Shoes rely on gravity to provide contact. They are not sprung. They require careful inspection for wear at regular intervals and have to be gauged to ensure they are not too high (poor contact) or too low (risk of fouling something on the track). Negative shoes, being only 1.5 inches above the running rail, are particularly prone to gauge defects and special "low negative shoe detectors" are provided at certain depots around the system. An alarm is sounded if a train is detected with a low negative shoe and it will not be allowed into service until inspected. Shoes can be lifted by train crew if it is required to isolate a car from the current supply. Crews are supposed to know which cars are fed from which shoes, but they have to lift shoes so rarely, it is difficult for them to remember. On older stocks, the shoes are lifted by ropes provided inside the car at suitable points. Once shoes are lifted, it is only possible to lower them from under the train, preferably in the depot. The 1995/6 Tube Stocks are equipped with push button shoe lifting and lowering control. London Underground tunnels are provided with lighting. Over the last few years, there has been an upgrade programme which has seen a big improvements in the lumination available in tunnels. The programme was originally inspired by a number of difficult evacuations, made more so by the poor lighting conditions. There was also the added benefit of better working conditions for maintenance staff. Tunnel lighting is powered from the LUL 400 V AC lighting main, not the 600 V DC traction supply. A relay controlled circuit senses the status of the DC supply and switches the tunnel lighting/power automatically when the traction current is *off*. There's also a manual switch at headwalls, to turn on tunnel lighting in emergencies. Traction current can be turned off by train crews in the tunnel by pinching together the two bare copper wires seen at window level in all LU tunnels. A handset, provided on the train, can also be connected to these wires to allow the train crew to speak to the controller. Including a response from Furry to question in uk.transport.london, 23 August 1999. Depots normally have their own sub-stations. Inside most sheds, there are no current rails. Trains are therefore supplied through overhead trolley leads, which are plugged into a "receptacle box" (a socket) provided at the side of (usually) motor cars. Fig 10: Overhead lead in receptacle box on 1973 Tube Stock car. Photo by Tube Troll. The trolley runs on a two-rail track suspended at roof level between each track. The two rail provide positive and negative current for the leads, which hang down from the trolley. A special plug on the end of the leads is placed in the receptacle box to provide 630 volts DC for the car concerned. 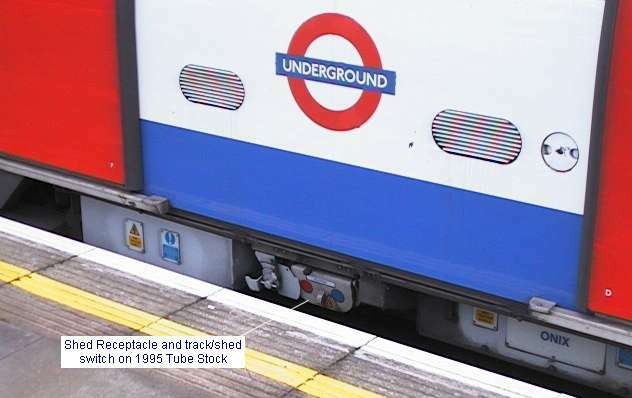 Modern stocks (199x Tube Stocks) have switches which prevent the shoes becoming live when an overhead lead is plugged in. 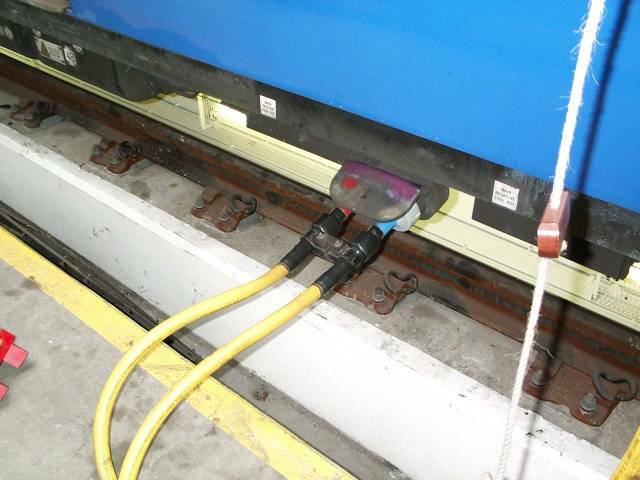 Fig 11: Shed receptacle on 1995 Tube Stock car. Fig 12 shows the overhead lead inserted into the receptacle box on the car. The box has a spring loaded lid to keep out water and dust while the train is in service. A rope is provided to allow the trolley to be pulled along the side of the train. In some cases the rope is tied to the train while it is driven slowly along under power. Hammersmith Depot does this as a regular practice. Note that Fig 12 shows ON and OFF indicators at roof level to show where the overhead trolley track is live. These are recent additions, imposed by recent Electricity at Work Regulations. Elaborate precautions are taken to ensure that the leads are not withdrawn while the train is drawing power, particularly traction power. A number of incidents have occurred in the past where receptacle boxes have been damaged by leads being pulled out as the train was leaving the depot. After some time in service, an arc was set up, causing smoke to appear. There were a couple of nasty incidents as a result. A number of modifications to receptacle box design have taken place over the years. Originally, all trains had them on the front of driving cars. From 1936, they were always located on the side of cars where there was less likelyhood of water and dust getting in. From 1967, the pins were set at a wider distance and shaped sockets provided to reduce the risk of the leads being inserted wrong way round. As there can be a lot of trouble if the crew forgets to remove the lead before the train leaves the depot, so a warning bleeper is provided in the cab if the train is being driven with a lead plugged in. Some depots are now provided with a dead section of trolley rail at the ends nearest the exits. If the trolley reaches this whilst plugged into a train, a detector on the train causes an emergency brake application. Tubeprune is only aware of this being used at present on the 1995 Tube Stock. This photo by Richard Griffin shows the power in the traction circuit as a train of A Stock accelerates away from Harrow-on-the-Hill and produces an arc as a shoe runs off a ramp at the end of a current rail. Such demonstrations of the power of electricity are a reminder to those who might be tempted to disregard the safety rules just how powerful it can be.